Boldly Chic Events: Gifts for Your Girls! I have finally, and ahead of schedule this year, finished my holiday shopping. For those of you that are still looking for the "perfect" gifts for your girlfriends, mother or sisters, here are my favorite ideas for the season! 1. 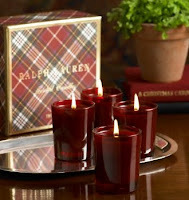 Ralph Lauren Candles - beautiful packaging and wonderful scents! 2. n.a.p. Luxe Foot Comforters - who doesn't love cozy, warm footwear? 3. Personalized Notecards - a classic. 4. Sisters Gourmet Cookie Mix - yum! 5. 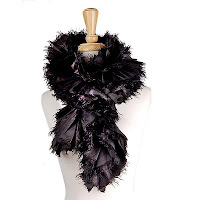 The "Boa" Scarf - luxe at it's best. 6. High-Shine-To-Go Glossware - great for travelers and for lip gloss lovers! 7. Multi-Color Bauble Necklace - for a girl who loves to have fun with her accessories. 8. Starbucks ANYTHING - who doesn't love SOMETHING from the infamous brand?! What other great ideas do you have to share? I would love to hear them!